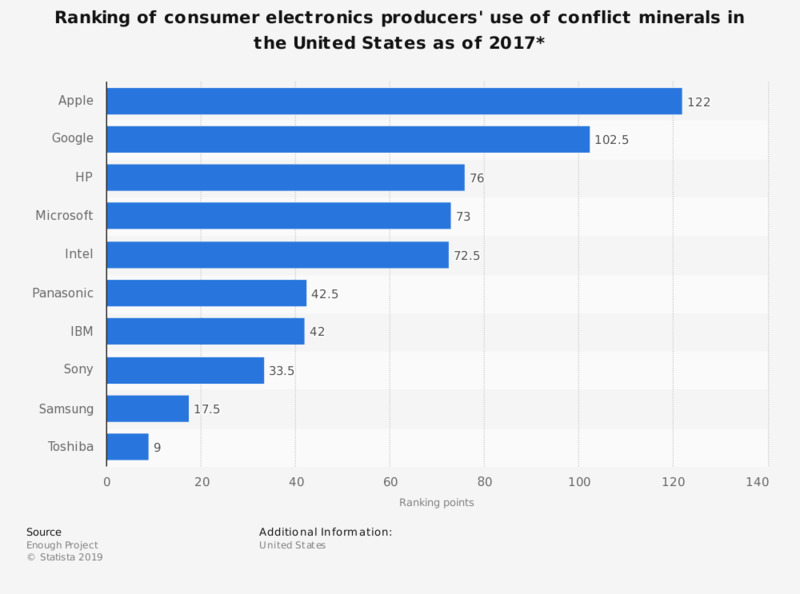 This statistic shows the ranking of selected consumer electronics companies in the United States based on the use of conflict minerals in 2017. During that year, Apple was the highest/best ranked of any consumer electronics company worldwide in terms of not having conflict minerals in their supply chain, scoring 114 out of a possible 120 points, plus eight additional points in extra credit, bringing Apple to a total score of 122. 1) Conducting conflict minerals sourcing due diligence and reporting. 2) Developing a conflict-free minerals trade and sourcing conflict-free minerals from Congo, particularly gold. 3)Supporting and improving livelihoods for artisanal mining communities in eastern Congo. Conflict minerals refer to tantalum, tin, tungsten, or gold (also know as 3TG) from regions where these materials are produced in conditions of armed conflict or human rights abuses. Which of the following online shops have you bought something from in the last 12 months?